The Boston Tea Party. What was happening before the Boston Tea Party? Despite the hopes of Patriots like Sam Adams, the Boston Massacre did not spark. 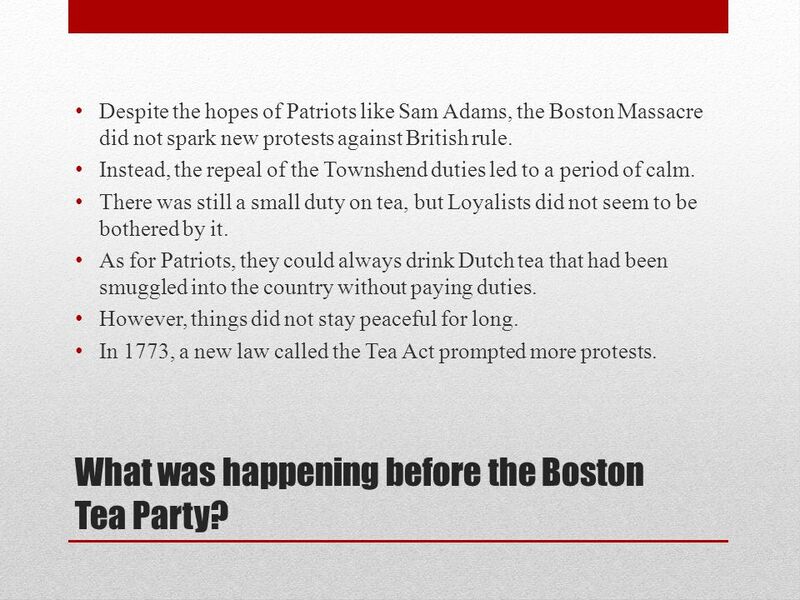 2 What was happening before the Boston Tea Party? Despite the hopes of Patriots like Sam Adams, the Boston Massacre did not spark new protests against British rule. Instead, the repeal of the Townshend duties led to a period of calm. There was still a small duty on tea, but Loyalists did not seem to be bothered by it. As for Patriots, they could always drink Dutch tea that had been smuggled into the country without paying duties. However, things did not stay peaceful for long. In 1773, a new law called the Tea Act prompted more protests. 3 The Tea Act The Tea Act, passed by Parliament on May 10, 1773, would launch the final spark to the revolutionary movement in Boston. The act was not intended to raise revenue in the American colonies, and in fact imposed no new taxes. It was designed to prop up the East India Company which was floundering financially and burdened with eighteen million pounds of unsold tea. This tea was to be shipped directly to the colonies, and sold at a bargain price. The Townshend Duties were still in place, however, and the radical leaders in America found reason to believe that this act was a maneuver to buy popular support for the taxes already in force. The direct sale of tea, via British agents, would also have undercut the business of local merchants. Colonists in Philadelphia and New York turned the tea ships back to Britain. In Charleston the cargo was left to rot on the docks. In Boston the Royal Governor was stubborn & held the ships in port, where the colonists would not allow them to unload. Cargoes of tea filled the harbor, and the British ship's crews were stalled in Boston looking for work and often finding trouble. This situation led to the Boston Tea Party. 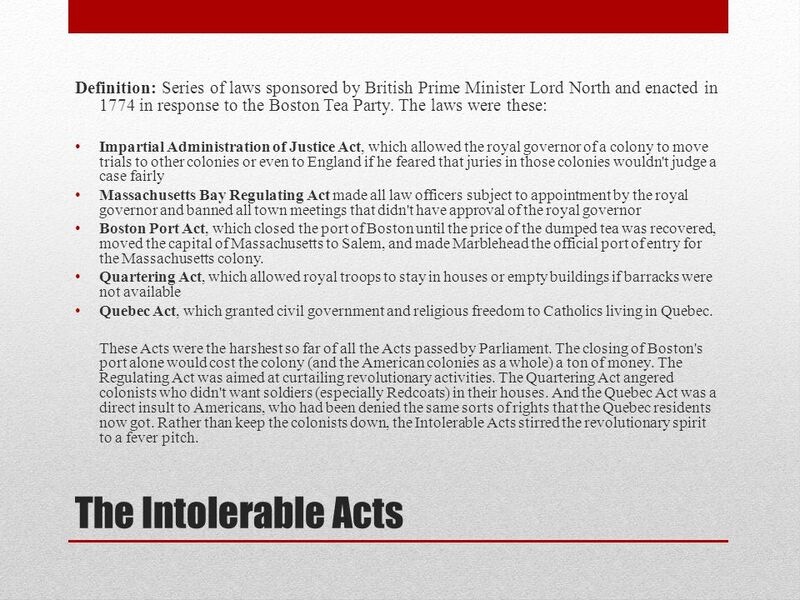 6 The Intolerable Acts Definition: Series of laws sponsored by British Prime Minister Lord North and enacted in 1774 in response to the Boston Tea Party. The laws were these: Impartial Administration of Justice Act, which allowed the royal governor of a colony to move trials to other colonies or even to England if he feared that juries in those colonies wouldn't judge a case fairly Massachusetts Bay Regulating Act made all law officers subject to appointment by the royal governor and banned all town meetings that didn't have approval of the royal governor Boston Port Act, which closed the port of Boston until the price of the dumped tea was recovered, moved the capital of Massachusetts to Salem, and made Marblehead the official port of entry for the Massachusetts colony. Quartering Act, which allowed royal troops to stay in houses or empty buildings if barracks were not available Quebec Act, which granted civil government and religious freedom to Catholics living in Quebec. These Acts were the harshest so far of all the Acts passed by Parliament. The closing of Boston's port alone would cost the colony (and the American colonies as a whole) a ton of money. The Regulating Act was aimed at curtailing revolutionary activities. The Quartering Act angered colonists who didn't want soldiers (especially Redcoats) in their houses. And the Quebec Act was a direct insult to Americans, who had been denied the same sorts of rights that the Quebec residents now got. Rather than keep the colonists down, the Intolerable Acts stirred the revolutionary spirit to a fever pitch. 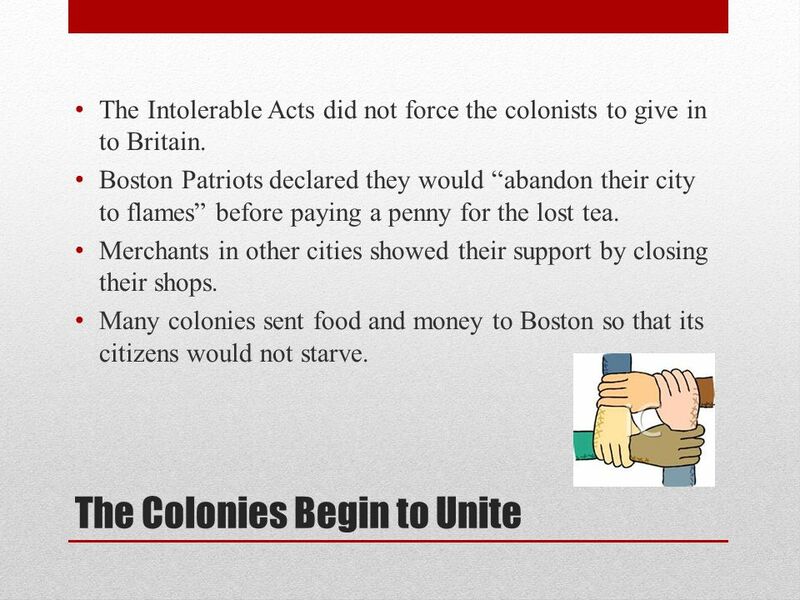 7 The Colonies Begin to Unite The Intolerable Acts did not force the colonists to give in to Britain. Boston Patriots declared they would “abandon their city to flames” before paying a penny for the lost tea. Merchants in other cities showed their support by closing their shops. Many colonies sent food and money to Boston so that its citizens would not starve. 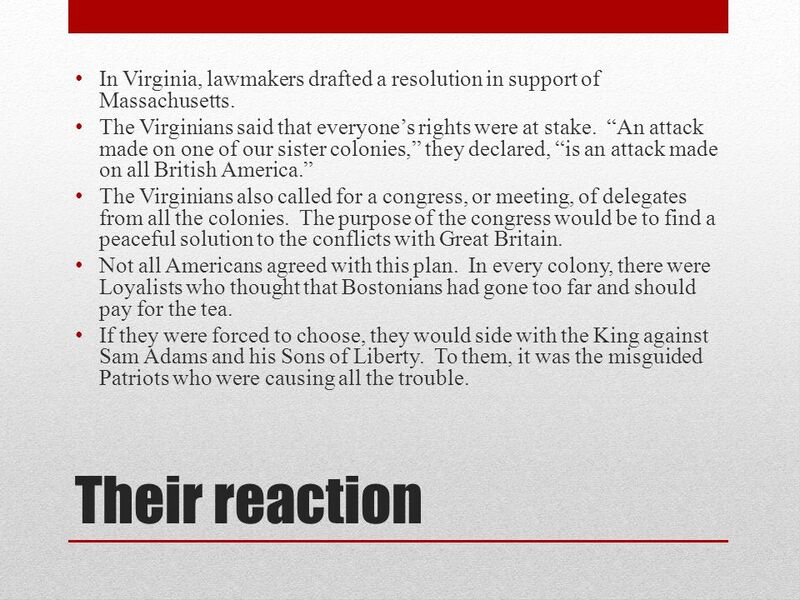 8 Their reaction In Virginia, lawmakers drafted a resolution in support of Massachusetts. The Virginians said that everyone’s rights were at stake. “An attack made on one of our sister colonies,” they declared, “is an attack made on all British America.” The Virginians also called for a congress, or meeting, of delegates from all the colonies. The purpose of the congress would be to find a peaceful solution to the conflicts with Great Britain. Not all Americans agreed with this plan. 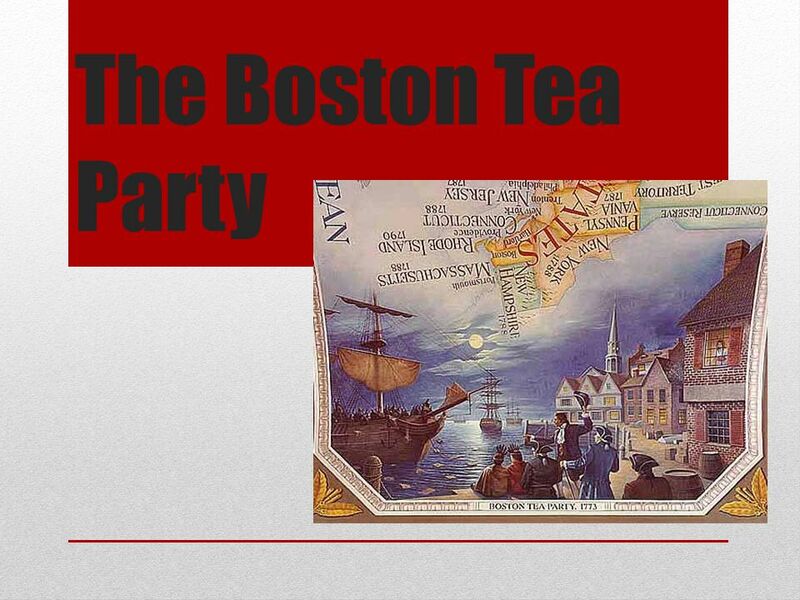 In every colony, there were Loyalists who thought that Bostonians had gone too far and should pay for the tea. If they were forced to choose, they would side with the King against Sam Adams and his Sons of Liberty. To them, it was the misguided Patriots who were causing all the trouble. 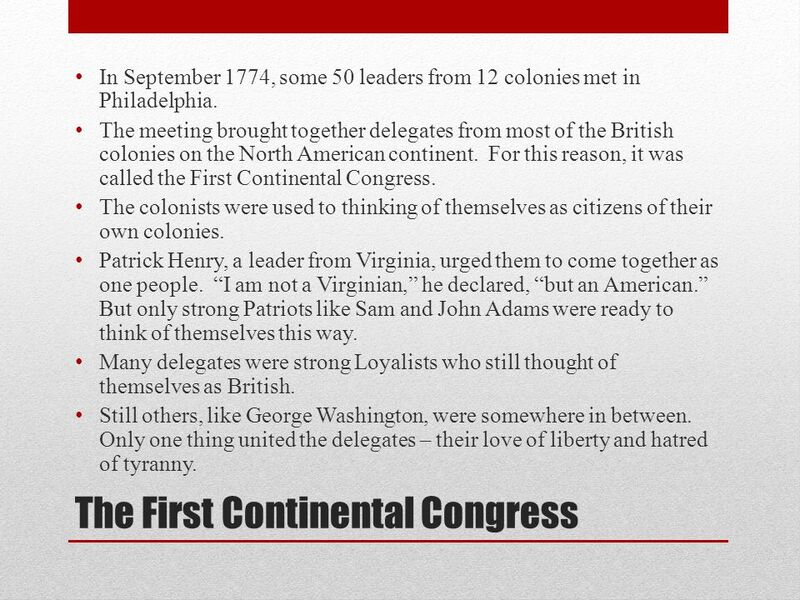 9 The First Continental Congress In September 1774, some 50 leaders from 12 colonies met in Philadelphia. The meeting brought together delegates from most of the British colonies on the North American continent. For this reason, it was called the First Continental Congress. The colonists were used to thinking of themselves as citizens of their own colonies. Patrick Henry, a leader from Virginia, urged them to come together as one people. “I am not a Virginian,” he declared, “but an American.” But only strong Patriots like Sam and John Adams were ready to think of themselves this way. Many delegates were strong Loyalists who still thought of themselves as British. Still others, like George Washington, were somewhere in between. Only one thing united the delegates – their love of liberty and hatred of tyranny. 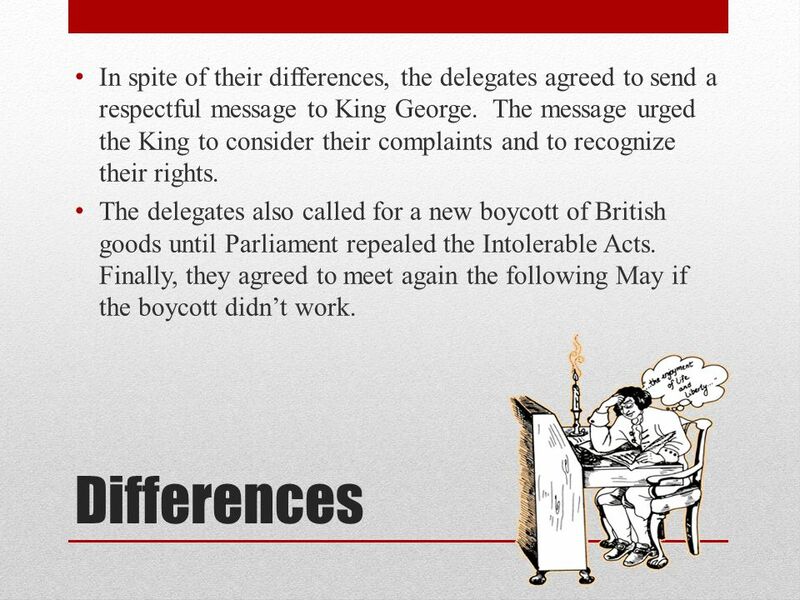 10 Differences In spite of their differences, the delegates agreed to send a respectful message to King George. The message urged the King to consider their complaints and to recognize their rights. The delegates also called for a new boycott of British goods until Parliament repealed the Intolerable Acts. Finally, they agreed to meet again the following May if the boycott didn’t work. 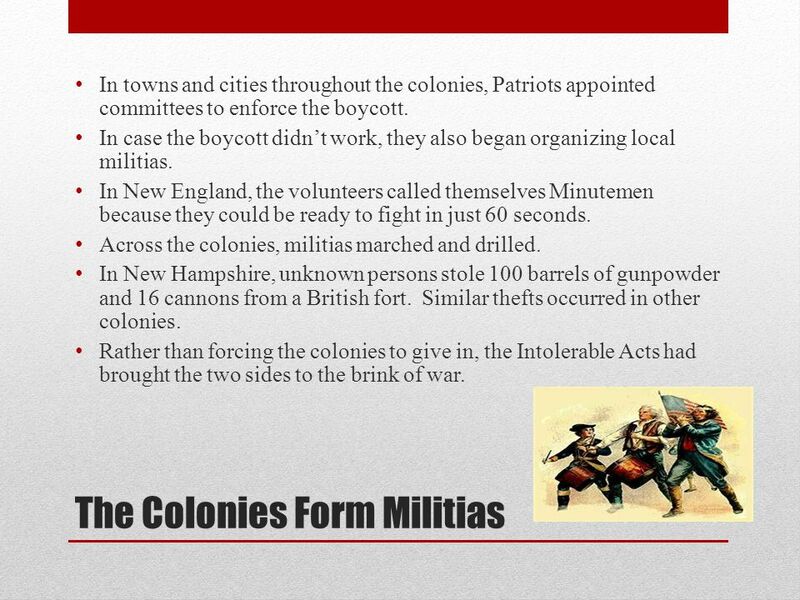 11 The Colonies Form Militias In towns and cities throughout the colonies, Patriots appointed committees to enforce the boycott. In case the boycott didn’t work, they also began organizing local militias. In New England, the volunteers called themselves Minutemen because they could be ready to fight in just 60 seconds. Across the colonies, militias marched and drilled. In New Hampshire, unknown persons stole 100 barrels of gunpowder and 16 cannons from a British fort. Similar thefts occurred in other colonies. Rather than forcing the colonies to give in, the Intolerable Acts had brought the two sides to the brink of war. 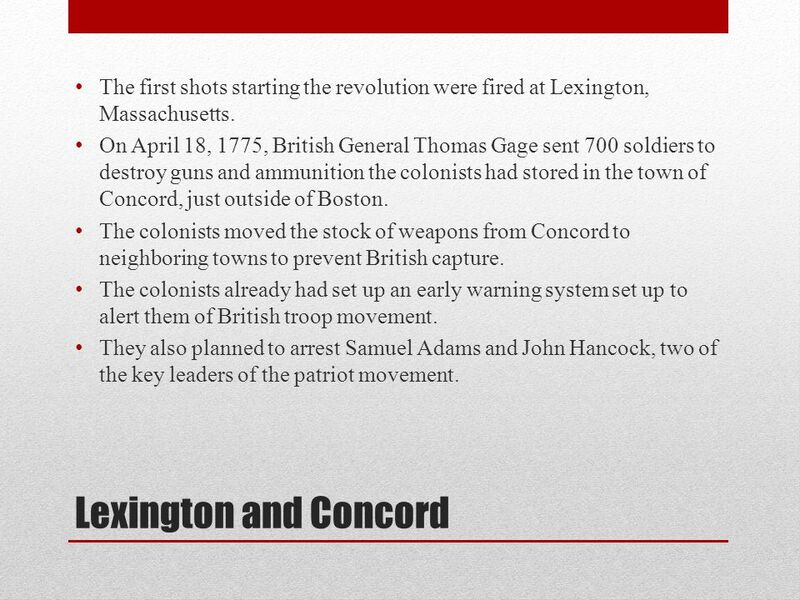 12 Lexington and Concord The first shots starting the revolution were fired at Lexington, Massachusetts. On April 18, 1775, British General Thomas Gage sent 700 soldiers to destroy guns and ammunition the colonists had stored in the town of Concord, just outside of Boston. The colonists moved the stock of weapons from Concord to neighboring towns to prevent British capture. The colonists already had set up an early warning system set up to alert them of British troop movement. They also planned to arrest Samuel Adams and John Hancock, two of the key leaders of the patriot movement. 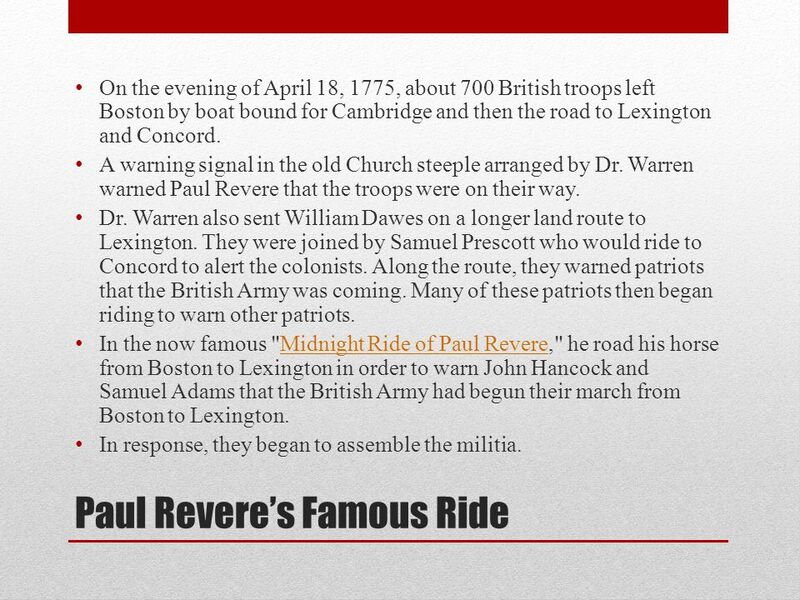 14 Paul Revere’s Famous Ride On the evening of April 18, 1775, about 700 British troops left Boston by boat bound for Cambridge and then the road to Lexington and Concord. A warning signal in the old Church steeple arranged by Dr. Warren warned Paul Revere that the troops were on their way. Dr. Warren also sent William Dawes on a longer land route to Lexington. 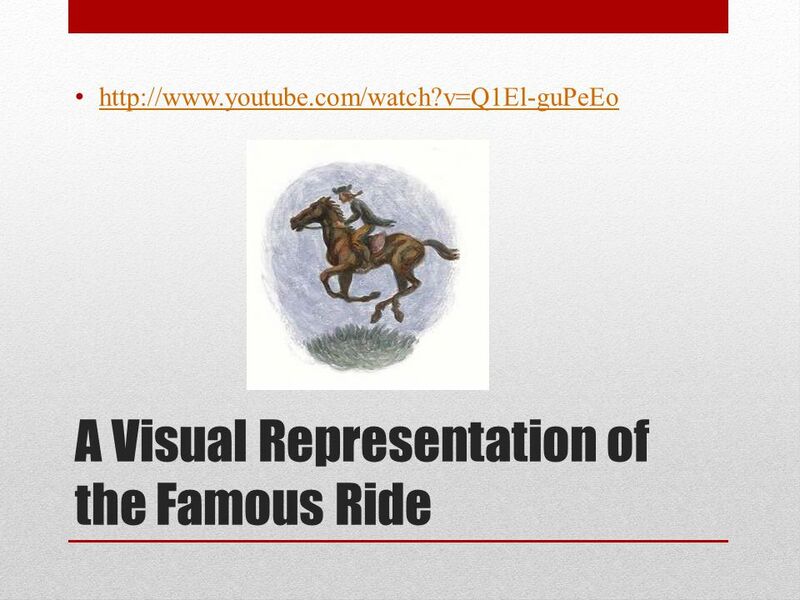 They were joined by Samuel Prescott who would ride to Concord to alert the colonists. Along the route, they warned patriots that the British Army was coming. Many of these patriots then began riding to warn other patriots. In the now famous "Midnight Ride of Paul Revere," he road his horse from Boston to Lexington in order to warn John Hancock and Samuel Adams that the British Army had begun their march from Boston to Lexington.Midnight Ride of Paul Revere In response, they began to assemble the militia. 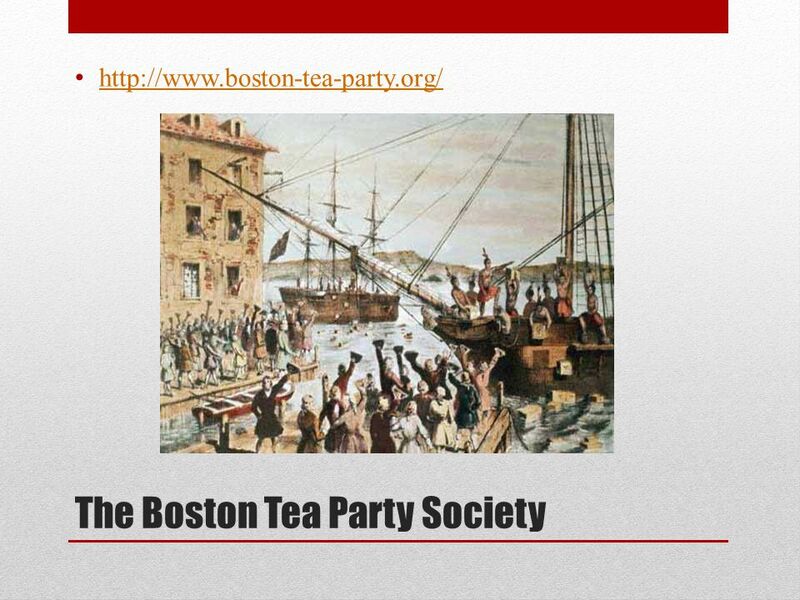 Download ppt "The Boston Tea Party. What was happening before the Boston Tea Party? Despite the hopes of Patriots like Sam Adams, the Boston Massacre did not spark." THE DIVIDE BETWEEN THE AMERICAN COLONISTS AND BRITAIN GROWS, AND EVENTUALLY LEADS TO WAR. The Road to Lexington and Concord. The Continental Congress The colonial leaders realized they needed more than boycotts. September 1774 first Continental Congress. In Philadelphia. A Call to Arms Chapter 5 Lesson 3. 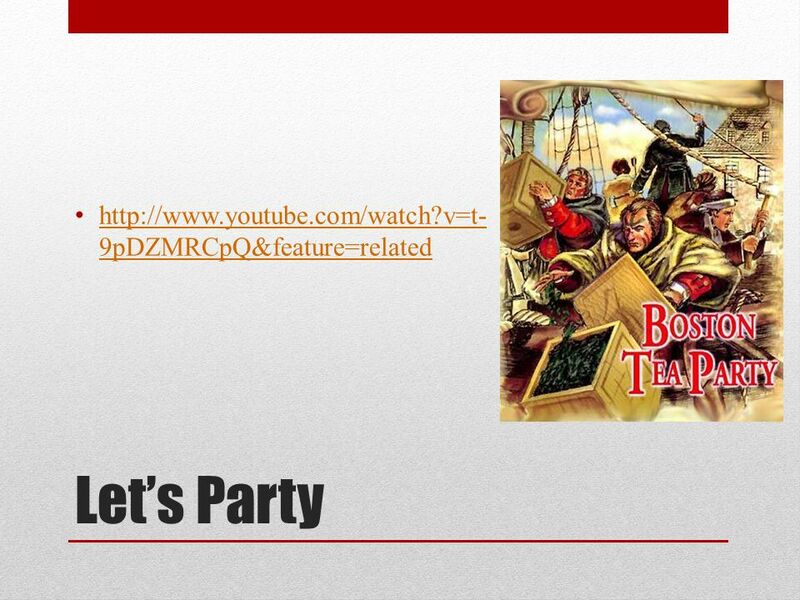 Objectives Identify the causes of the Boston Tea Party. Chapter 5 Section 3: From Protest to Rebellion. The road to Lexington and Concord. In this section you will learn that tensions between Britain and the colonies led to armed conflict in Massachusetts. TEKS 8C: Calculate percent composition and empirical and molecular formulas. Lead Up to the Revolution 2. 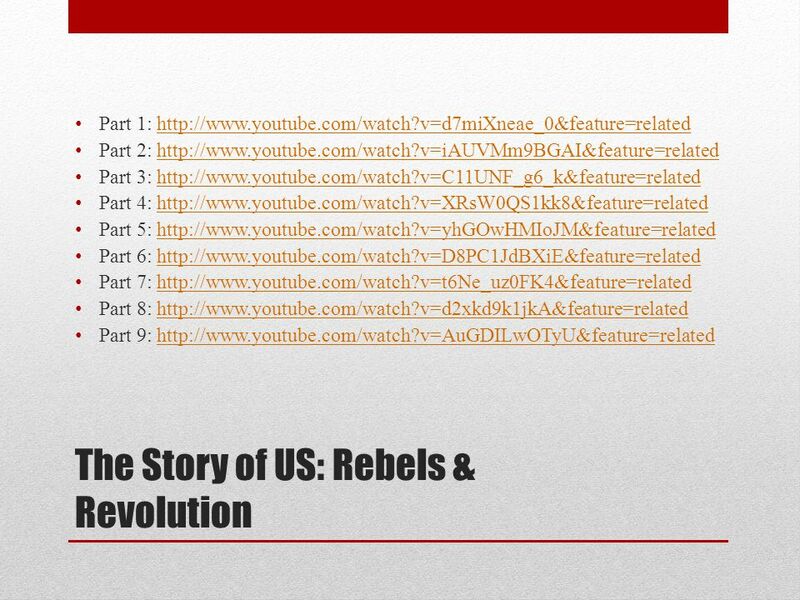 The Stirrings of Rebellion US History Outline notes New method while reading Subheadings=main ideas Each subheading has bullet points outlining. HOW DID THE ACTION OF CITIZENS CREATE CHANGE IN THE AMERICAN COLONIES? Aim: How did Colonial discontent lead to the outbreak of the Revolutionary War? Do Now: Why were the colonists so upset? Based on this account, does it. Chapter 8 The Road to War. Moving to a Revolution. Tea Act (1773) Allowed the British East India Company to sell tea directly to the colonists, no middle-man Tea would actually. 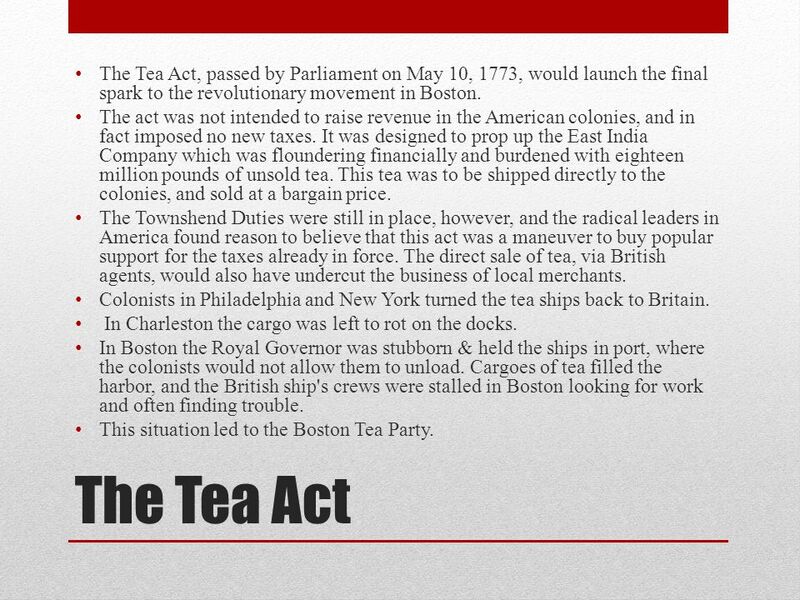 The Tea Act. OPTICS Student Expectation Analyze the causes of the American Revolution, including the Boston Tea Party and the Tea Act. Causes of the American Revolution. Introduction… Hi! I’m Miss Holly. Welcome to Level 5 Social Studies! Today you will learn about: causes that led to. Tuesday, Nov. 8 1. Update your table of contents DateTitle Entry # 11/4Boston Massacre written Primary Source 50 11/4Boston Massacre OPTIC 51 11/7 Colonial.